Understanding your responsibilities and knowing what to look for when it comes to mileage and wear before you turn in your vehicle is important. The three important steps below can reduce the risk of potential surprises at lease end. Regular maintenance, mileage and your vehicle's condition are items for which you are responsible. Now is a good time to review your lease agreement to determine if you are over your agreed-upon miles and check your vehicle for repair items that may require attention. Normal wear is expected on your lease vehicle. Excess wear, however, is your responsibility. If you don't know where to begin in determining the difference, The Wear Table can help. It was designed with you in mind and to help avoid surprises down the road. See how your car measures up with our Wear Tool. The Wear Tool is a vehicle self-inspection tool that can be used to determine areas of excess wear. The sizes outlined on The Wear Tool are representative of normal wear and use dimensions. It’s important to know what to look for regarding mileage and wear before you turn in your vehicle. As stated in your Chrysler Capital Lease Agreement, mileage, the condition of your vehicle and its maintenance are your responsibility. Excessive mileage and wear will result in additional charges. At the end of your lease, you will receive a ﬁnal bill. Contact us at 855-383-0558 with any questions about added fees. The first step in analyzing mileage is to check your Chrysler Capital Lease Agreement to conﬁrm the total number of miles allocated for the duration of your lease. Based on your mileage allowance, excess miles will be calculated as any miles driven above the maximum miles outlined in your agreement. Your agreement also states the per-mile charge for any additional miles. If applicable, the excess mileage charge will be assessed when your vehicle is returned. To avoid unwanted surprises, the descriptions and tables on the following pages will provide you with identifiable characteristics of normal and excess wear. Normal wear, as the name suggests, is expected and accounted for in your Chrysler Capital Lease Agreement. However, excess wear is your responsibility and will result in additional cost to you. Normal wear does not result in additional charges. Inflicting such damage upon your vehicle will result in additional charges at turn-in. To best protect against additional charges, repairs should be completed prior to your lease agreement ending. To help determine if your vehicle has excess wear, we have provided The Wear Table. This table will give you a better idea of whether your vehicle has excess wear prior to your vehicle inspection. An approved inspection will still be required before you turn in your vehicle. You may take into consideration the condition of your vehicle when assessing which end-of-lease option works best for you. Ideally, your vehicle will have no excess wear, but we suggest using The Wear Tool to avoid surprises that could come up during your official inspection. 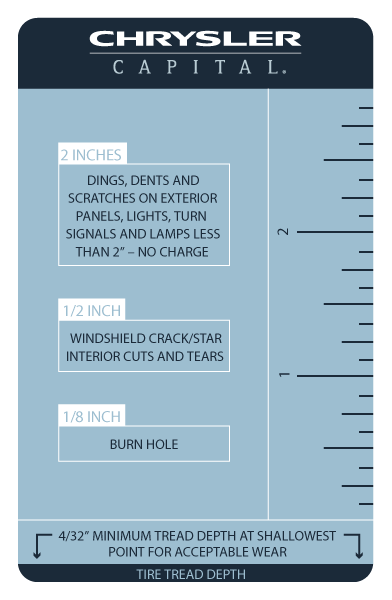 Acceptable sizes of various types of normal wear are noted on The Wear Tool, along with measuring guidelines to assist in performing a self-inspection. If you identify necessary repairs, we recommend ensuring all repairs are completed by a certified mechanic and/or repair technician prior to your turn-in date. Keep in mind, some repairs may be covered under warranty or insurance.